William J. Rothwell, Ph.D., SPHR, SHRM-SCP, CPLP Fellow is President of Rothwell & Associates, Inc. and Rothwell & Associates, LLC (see www.rothwellandassociates.com). He is also a Professor-in-Charge of the Workforce Education and Development program, Department of Learning and Performance Systems, at The Pennsylvania State University, University Park campus. He has authored, co-authored, edited, or co-edited 300 books, book chapters, and articles—including over 90 books. Before arriving at Penn State in 1993, he had 20 years of work experience as a Training Director, HR and Organization Development in government and in business. He has also worked as a consultant for over 40 multinational corporations--including Motorola China, General Motors, Ford, and many others. In 2012 he earned ASTD’s prestigious Distinguished Contribution to Workplace Learning and Performance Award, and in 2013 ASTD honored him by naming him as a Certified Professional in Learning and Performance (CPLP) Fellow. In 2014 he was given the Asia-Pacific International Personality Brandlaureate Award (see http://www.thebrandlaureate.com/awards/ibp_bpa.php). He was the first U.S. citizen named a Certified Training and Development Professional (CTDP) by the Canadian Society for Training and Development in 2004. His recent books include Organization Development in Practice (ODNETWORK, 2016), Mastering the Instructional Design Process, 5th ed. (Wiley, 2016), Effective Succession Planning, 5th ed. (Amacom, 2015), Practicing Organization Development, 4th ed. (Wiley, 2015), The Leader’s Daily Role in Talent Management (McGraw-Hill, 2015), Beyond Training and Development, 3rd ed. (HRD Press, 2015), Career Planning and Succession Management, 2nd ed. (Praeger, 2015), Organization Development Fundamentals: Managing Strategic Change (ATD Press, 2015), The Competency Toolkit, 2 vols, 2nd ed. (HRD Press, 2015). See www.rothwellandassociates.com for a comprehensive list of publications. He can be reached by email at wjr9@psu.edu, by phone at 814-863-2581, or 310B Keller Building, University Park, PA 16803. Maureen Connelly Jones, Ph.D., RN is a Senior Instructor and Teaching Assistant Professor for the Master of Health Administration Program at The Pennsylvania State University. Dr. Jones has taught in higher education for 20 years in both nursing and health policy and administration and has been in the healthcare industry for over 25 years. She received her Ph.D. from Penn State with an emphasis in Organization Development and Human Resource Management. She has broad expertise in the education arena in both residential and online programs: development of a certificate program, curriculum development, and course creation, outcomes evaluation, curriculum mapping, and competency based education. She brings an extensive and diverse healthcare experience to the students, her research, and the organizations with whom she partners. Her management roles included program manager, hospital supervisor, practice advancement specialist, educator, and project manager. She has held clinical roles in emergency/trauma (Level I), pediatric and adult Leer jet flight nursing, critical care, emergency medical services (paramedic), orthopedics, joint reconstruction, medical/surgical, and hospital-wide education. Her research explores the necessary characteristic for health care executives. She explores how health care CEOs lead during crisis by identifying CEO characteristics through interviews with the CEOs and members of their executive team. This research will build toward development of a competency model for use in health care executive selection. In addition to her research agenda, Dr. Jones has a passion for helping organizations create success surrounding workforce planning/succession planning/talent management and has published chapters in two books: Talent Management: A Step-by-Step Action-Oriented Guide Based on Best Practice and Career Planning and Succession Management: Developing Your Organization’s Talent for Today and Tomorrow. Ji Won Park is a Ph.D. candidate (ABD) in the Workforce Education and Development program, Department of Learning and Performance Systems at The Pennsylvania State University. Prior to studying at Penn State, she worked as a HRD practitioner and an analyst at the HRD Center in a major corporation in South Korea. Her career has focused on organization development and leadership development. She holds a B.A. in Business Administration at Yonsei University and a master’s degree in Corporate Education at Korea University in Seoul, South Korea. Her research interests include organizational change, employee engagement, and the leadership development of managers and women. She has published several books and journal articles related to Korea women's human resources and employee work engagement. You can reach her at jup268@psu.edu. M.J. Park earned her PhD, with an emphasis in Human Resource Development and Organization Development, in the Workforce Education and Development (WFED) program at the Pennsylvania State University in December of 2015. In 2011, she earned, and has since maintained, her Senior Professional in Human Resources (SPHR) certification. Annually, since 2013, Dr. Park has served as a peer reviewer for manuscripts submitted to the Association for Human Resource Development (AHRD) Conferences in the Global and Cross Cultural Issues Track.Dr. Park’s primary research areas of interest include Organizational Change and Employee Work Engagement. Dr. Park is a co-author of Strategic Planning in the Human Resources Encyclopedia Vol 2, Dr. William J. Rothwell, editor. 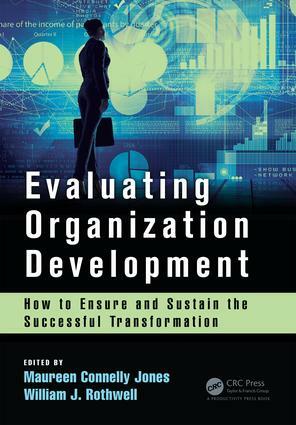 In addition to Why Evaluate Organizational Change Efforts?, she is currently completing several articles based on her dissertation findings. For more than a decade, Dr. Park has taught at the post-secondary level in multiple institutions and platform environments. Prior to teaching, Dr. Park was an executive manager in industry and was the chief liaison for a $200 million acquisition. During that time, she also managed her family and earned both her BA in Business Administration and MBA at Georgia State University in Atlanta, GA. Since 2011, she has served as an instructor of Management, Marketing, and Business Education at Bloomsburg University of Pennsylvania. She also served as an instructor of Management at Millersville University from 2014-2015. EDWIN MOURIÑO, PH.D.?A highly motivated and experienced professional with 30+ years of leading key elements of organizational change projects. Dr. Mouriño is a USAF veteran who brings extensive experience in leadership development, organizational change, executive coaching, team development, diversity, and learning & development. In addition, he brings broad industry experience. He has served as a thought leader in his areas of focus and by enabling a learning organization by integrating organizational strategy with a corporate university infrastructure. Presently he is an Assistant Professor at Rollins college educating Business undergraduate and graduate HR students. He is the author of The Perfect Human Capital Storm: Workplace Challenges and Opportunities in the 21st Century and a fiction book Gringo-Latino: Historias/Stories of Pursuing El Sueño Americano/American Dream. He is also founder and President of his organization Human Capital Development: Helping Leaders Help Themselves. Veronica David is a human resources professional who works for The Pennsylvania State University in the Department of Labor and Employee Relations. Veronica has worked in various areas of Human Resources at The Pennsylvania State University, including: recruitment, on-boarding, compensation, and classification. Veronica is currently working towards her Doctorate in Workforce Education and Development, with a focus in Human Resources Development and Organizational Development. She is currently a doctoral candidate.